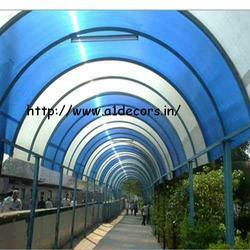 We are offering our clients a wide variety of Polycarbonate Structures. 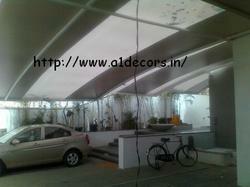 Products we offer are extensively used in schools, buildings, malls and other commercial buildings. To ensure the everlasting performance, these products are fabricated using high-grade raw material and advanced technology. Moreover, these products are properly examined by the team of deft experts before dispatch and delivering these products at the patrons' end. We welcome queries from Tamil Nadu including Chennai, Madras, Coimbatore, Kanyakumari, Nilgiris, Tirupur, Vellore, etc. We are one step ahead of our competitors in manufacturing and supplying Skylight Polycarbonate Sheet to esteemed patrons. Products we offer are designed under proper supervision and surveillance of highly experienced and skillful team of experts. Moreover, these products are manufactured utilizing high quality raw material, which is sourced from the trusted vendors in the market. These products are used in parks, commercial complex and school. Looking for Polycarbonate Structures ?